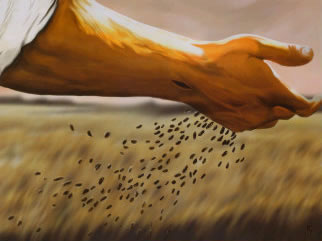 ODAY’S GOSEPL PARABLE is one of the few parables that Jesus actually explained. But it seems He only explained it to his disciples or closer followers later on. And then He gives a rather mysterious reason why He is explaining it to them and not to the general public. Different commentators have different explanations and opinions about this. I prefer just to dwell on the topic of hearing the word of God. If one attends Mass regularly, one certainly hears an abundance of the Word of God. Every Sunday there are three different Readings, one from the Old Testament which is in some way or other tied in with the reading from one of the Gospels. Then there is a selection from one of the Epistles or other New Testament Readings. A so-called Responsorial Psalm, also taken from the Bible always follows the First Old Testament Reading. Also the intervening chants are usually based on some text from the Scriptures. So you are certainly given much opportunity to hear the Word of God. The Church has always given special preference to the Word of God. First of all because we believe that its writers were inspired by God to write what they did. And at least at Mass, the Church has refrained from introducing and using other writers. Other writers might be able to write better and be more appealing. But they can’t make the claim of being inspired by God. There are plenty of other opportunities when they can be read and enjoyed with profit, but not at Mass. Admittedly that is a side issue that just seemed to creep in. A practical suggestion: As I indicated at the beginning, there is no doubt that Catholics are hearing a lot more of the Bible now than they used to. In some respects we have to say that this is good. It is hard to say what kind of results it is producing. The Bible and what it contains should be a very practical book for us, i.e. it should lead to active practice in our lives. If we would concentrate on one piece of advice learned each week and practice it, our general behavior and manner of living would soon change. I suggest that you pick out something each week to ‘hear’ and let fall on good soil so that it can produce good results. For a specific passage, I suggest that you look at this week’s selection from St. Paul’s letter to the Romans where he says: “The sufferings of this present time are as nothing compared with the glory to be revealed in us.” First of all, make sure that you know the meaning. St. Paul is saying that any suffering or hardship that we have to endure here on this earth is going to seem as nothing when we finally reach the glory of heaven which Jesus has prepared for us who have tried to serve Him while we were on this earth.